Antanas Sutkus (b. 1939) bought his first camera as a child, having not earned enough to buy a bicycle when digging peat with his mother. He later became a photojournalist and, since 1968, has worked as an independent photographer. He has also helped Lithuanian photographers gain international recognition as co-founder and President of the Photography Art Society of Lithuania, which championed photography as an art form. His humanistic approach, heavily influenced by the French photographer Henri Cartier-Bresson, comes to the fore in his images of people, young and old. Filled with romance, beauty and sadness, they move beyond photographic realism to resemble stills from an unmade film. His stated aim is ‘to make an attempt at drawing a psychological portrait of contemporary man’. Beyond recording events, Sutkus’ keen eye finds history within human faces: ’One has to love people in order to take pictures of them.’ His black and white portraits manage to avoid sentimentality but have great pathos. One series bears witness to Soviet rule in Lithuania during the Communist era and shows ordinary Lithuanians going about their everyday quotidian lives, which provides a striking contrast to the model citizens and workers promoted by Soviet propaganda. 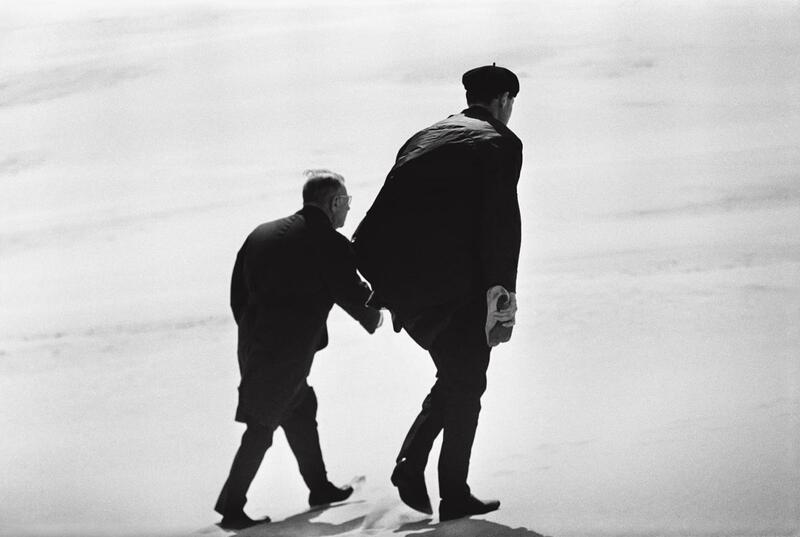 His series taken in an orphanage for blind children produced the profoundly affecting Blind Pioneer (1962). Sutkus is also famous for his portraits of Jean-Paul Sartre, taken when he and Simone de Beauvoir visited Lithuania in 1965. These two famous French intellectuals were accompanied on a trip to the dunes of the Curonian Spit by a group of Lithuanian writers and artists, including the still unknown 26-year-old photographer Antanas Sutkus, who managed to capture his iconic portrait of the great existentialist. In 2001-02, Sutkus won the Erna & Victor Hasselblad Foundation Grant, Sweden, for ‘Documentation and Conservation of Antanas Sutkus’ Archive of Photographs’. In 2011 he was nominated for the Deutsche Borse Photography Prize. In 2015 he has been granted the honourable state award of France – the order of art and literature for the dissemination of French culture.